If you solder many hours a week you don’t want to scrimp on your iron, but for an entry-level price the occasional user can get some nice features and accessories with this dual-temperature iron from Black & Decker. When you slide the temperature switch from low (500°F) to high (900°F) the indicator light turns from yellow to red, visually indicating the temperature. The cooling stand holds a sponge, a storage drawer for the tips, and two bendable third hands for holding workpieces secure while soldering. 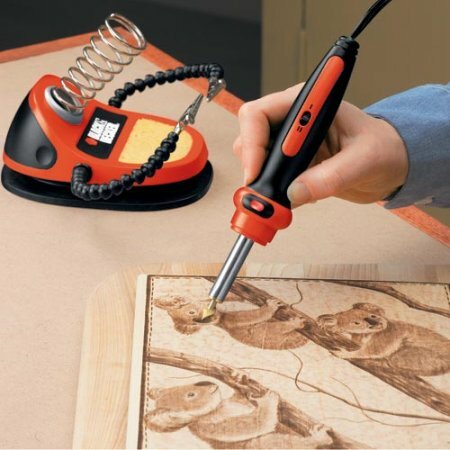 Black & Decker includes seven tips with the iron: a soldering tip, a universal tip, a round tip, a teardrop tip, a tapered tip, a hot knife, and a mini-iron. You can pick up the soldering and craft iron kit for $20 to $30. The arms with alligator clips is a very nice feature. I found an old box in my attic when I moved in – an old wood burning kit with a couple unused patterns. Age on the box stated 6 years and up. My brother had one, I recall. Wouldn’t see that product today, or a Chemistry set with real chemicals for that matter. This is just what I need to start my Koala wood burning project.